How cute is the little Easter Egg Banner?! We find decorating for Easter really refreshing. Even more refreshing is crafting for Easter. The colors and themes are always so fun and cheery. 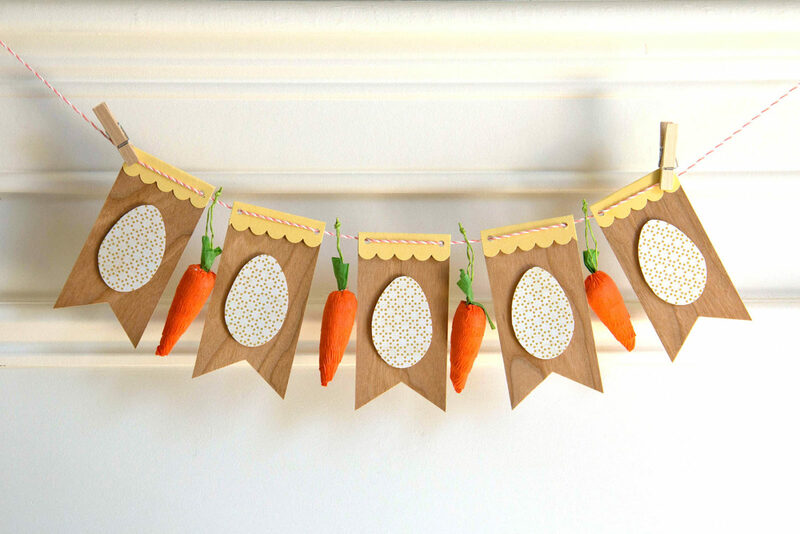 This week we are sharing this little bitty Easter egg banner that is a darling addition to your Easter Decor. This Easter banner is easy to create with a few simple supplies. Directions and supplies are listed below. 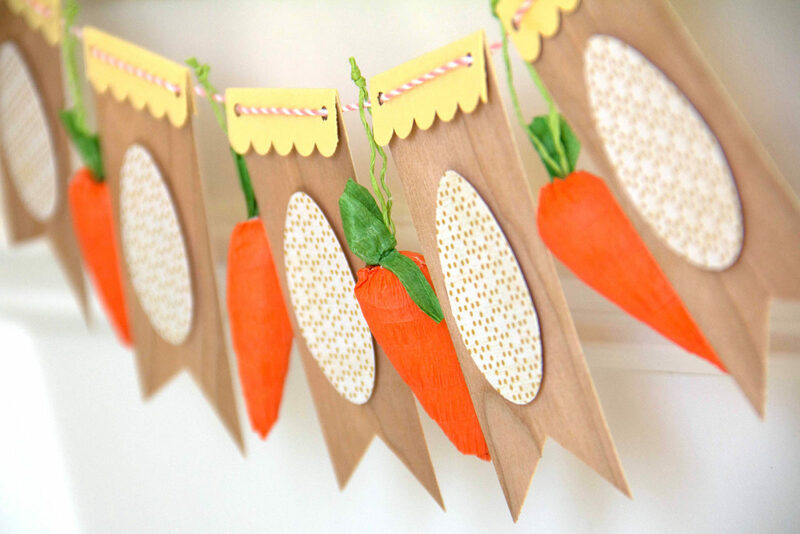 Real Cherry Wood paper, pattern paper, yellow card stock, scallop paper punch, pink baker’s twine, mini wood clothespins, crape paper carrots (found at the dollar spot in Target), hole punch, adhesive and scissors. Cut 6 pieces Real Cherry Wood paper to measure 4″ x 2″. Cut a triangle flag shape on the bottom of each wood piece. Cut 6 egg shapes from a sheet of pattern paper. Adhere each egg to each 4″ x 2″ wood piece with foam adhesive. Cut 6 pieces of yellow card stock to 2″ x 1″. Border one edge of each piece using a scallop border punch. Adhere scalloped yellow card stock to top of 4″ x 2″ Cherry Wood piece, approximately 1/2″ down. Folder over to backside of Cherry Wood paper and adhere. Punch a hole in each top corner of assembled banner piece. Arrange banner on desk. 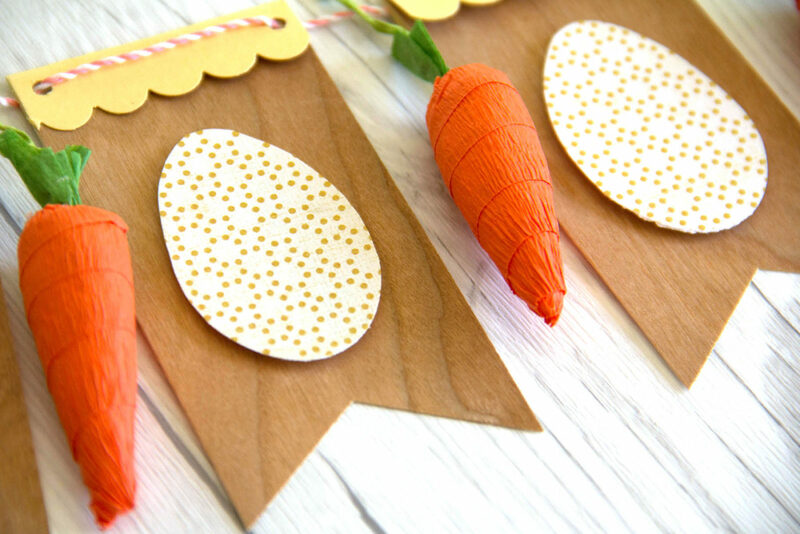 Alternate banner piece with crape paper carrot piece (or any other Easter themed item). Thread pink baker’s twine through banner and carrots. This entry was posted in Crafts & Kits, DIY Projects, Home Decor and tagged Baker's Twine, banner, Cherry Wood paper, Easter, Easter craft, foam adhesive, Home Decor, real wood paper.